As Saskia continues to enjoy her time in Chile she has shared with us some of the things that she and the other volunteers have been getting up to when they have time off. If you want to catch up with what she has been up to read posts one and two here. 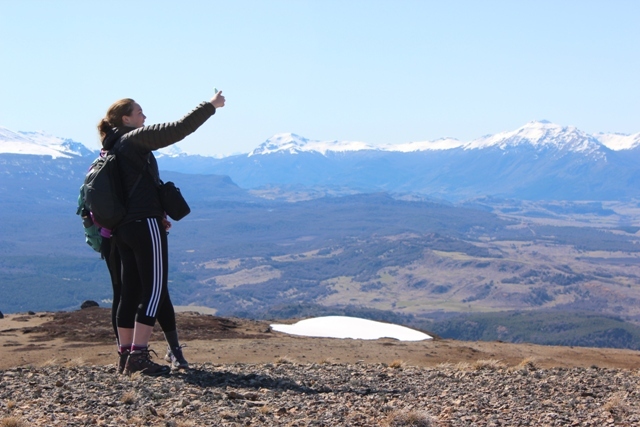 “Just outside of town is the Reserva Nacional Coyhaique, here there are 3 main hikes, of which my favourite has got to be the big one up to the top of Cerro Cinchao. After always saying “we’ll do it this weekend” and always waking up too late, we managed to make it out of bed and to the park in time to complete it last Saturday. Luckily it was the nicest day (weather wise) that we’ve had so far and hence the views were amazing! The hike starts through the forest and seems fairly tame as the paths are very well marked and the incline is pretty mild. Once you turn off onto the main Cinchao route however, it starts to zig zag up and you begin to gain height much faster. At this point we all massively de-layered as I regretted not sticking to my dad’s wise words, “be bold start cold”. After around 3 hours of walking we made it to the tree line, and although we were only about 100m from the peak, the view was too good and we were too hungry not to stop for lunch. 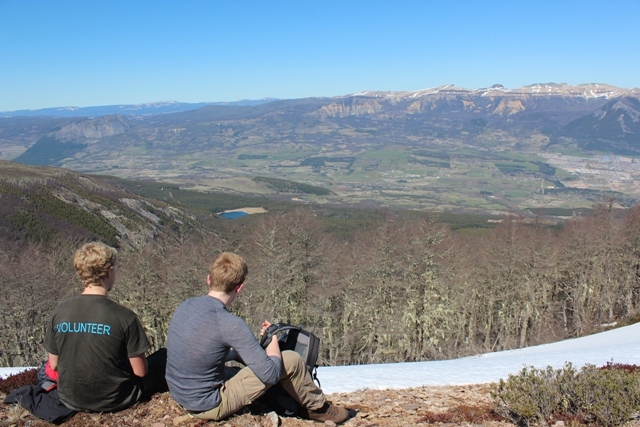 This ended up being a 2 hour break as we all lay in the sun taking in the amazing views over Coyhaique and the surrounding mountains, but eventually, filled with cheese and crackers we managed to get up. One of the really cool things about this walk is that the scenery changes so much throughout, once you approach the peak the landscape suddenly becomes very barren and I felt almost as though we could’ve been in the middle of a desert. After a few essential selfies and classic gap year pictures with the panoramic views, we carried on around the other side of the mountain. At this point however, the path disappears and so we decided, since it was clearly marked on the map, to follow some wooden posts that seemed to occur at around 200m intervals. The landscape by now had changed again, and large sections of the ground were coated with snow, and of course since we had been told we wouldn’t make it through these areas- we now had to. The major decision of the day came as the sun was dangerously close to sinking behind our mountain, and immediately the layers would need to go back on. After our wooden markers had stopped we were faced with snow covered forest and no path, we did however have a set of vague footprints. The group voted and we decided that since the path must exist, following the footsteps would be better than surrendering and turning back, that was not an option. The decision was justified by Thomas and Charlie saying that it didn’t really matter what we chose since they probably had enough layers to last the night, although I knew this was not a possibility since my host mum would run up the mountain in her pyjamas before letting me miss Once (the Chilean version of supper). If you think you would like to take part in a similar adventure then make sure you check out our website. Previous Post Why travel abroad with someone?